We offer a team sign for $150 as an option. Also available is a detachable chrome stack for $175 as an add on option. Our cook chamber doors are sealed with high temp fiberglass gaskets & a second cooking rack is a $75 add on option. The fire door is gasketed with two toggle clamps to keep it sealed tight. The aluminum door handle and air intake adjusting wheel stay cool to the touch under normal use. The 24"x4' backyard pit is fuel efficient thanks to the insulated fire box. 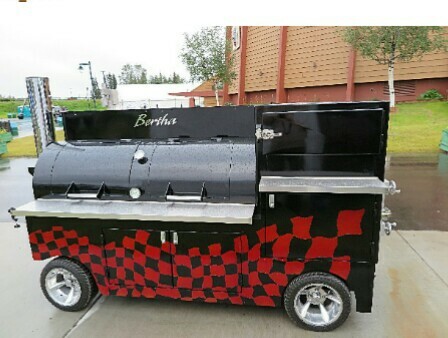 Standard features include 2" insulated firebox with 1/4" interior, 1/4" thick fire door, 3/16" rolled steel cook chamber, 5" stack, high temp door gaskets, toggle clamps on the fire door, aluminum handle's, folding stainless shelf, heavy duty back wheels & high temp black paint. This unit comes with five 18"x23" racks all spaced 4" apart. We have included a channel to run all of your BBQ Guru probe wires from the lockable storage box to the cook chamber behind the rack runners. The firebox has a 2" thick insulated fire door, 2" air intake ball valve, toggle clamp door latch, high temprature fiberglass door gasket, ash pan & stainless charcoal grate. Our small gravity feed will run around 18 hours on one 20# bag of charcoal. Standard features include 18" wide cook chamber, 2" door & cook chamber insulation, 3"-8" insulation around the firebox & chute areas, high temp fiberglass door gaskets, 4 tie-downs, winch hook, 2" ball valve air intake, 10"x3" rear tires with 6" front casters, toggle clamps on all doors, slam latch on the cook chamber door, built in lockable BBQ Guru storage area with channels to run all wires out of site, 6" front casters, 10" rear steel wheels with rubber tread, high heat black paint on fire door & automotive paint on everything else. The racks are 23"deep x 32" wide with plenty of room for two full sized pans & still have proper airflow. We have a lockable built-in storage are for your BBQ Guru. Built-in tubing to run the fan & power cords out of sight from the bottom of the pit to the storage area. Also a channel running behind the rack runners to place the temprature probes to the rack you need. Our large gravity feed is best suited as a trailer mount they are big & heavy with around a 12 hour burn time. 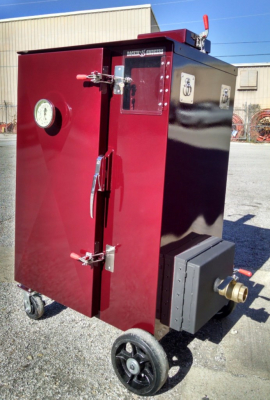 Standard features include 32" wide cook chamber, 2" door & cook chamber insulation, high temp fiberglass door gaskets, 3"-8" insulation around the firebox & chute areas, 4 tie-downs, winch hook, 2" ball valve air intake, toggle clamps on all doors, slam latch on the cook chamber door, built in lockable BBQ Guru storage area with channels to run all wires out of site, 4 solid legs to attach to your trailer, high heat black paint on fire door & automotive paint on everything else. The 30" cook chambers offer plenty of cooking space for an even smoke. Whether you are cooking one chicken or a full load, our pits cook even. An extra long stainless steel shelf gives you extra room to place your spices and still have room for a big box of foil. 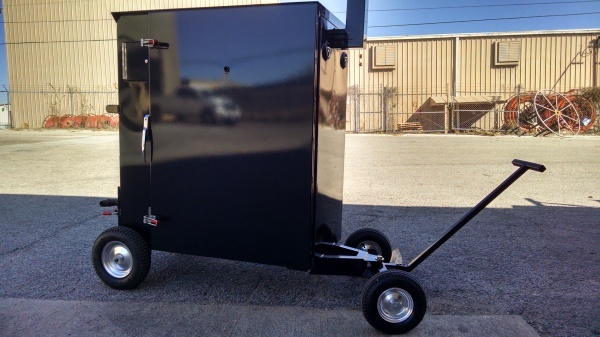 Every pit starts on a triple beam 4"x2" steel frame with a 3,500# torsion axle, 14 guage body, large front storage box with gas assist door, under cook chamber wood storage area, team sign, aluminum wheels & LED running and brake lights. The cook chamber is 30"x60" x 3/16" (7 Gauge) rolled steel not pipe, a second cooking rack on the front half, aluminum door handles, extra long stainless shelf & high temp fiberglass gaskets on the doors. The firebox has a 1/4" interior, 3/16" exterior, 4" of insulation, high temp fiberglass door gasket, 2" insulated fire door, slam latch & a easy to use air intake system with an aluminum hand wheel for the adjustments. The pit is painted with high heat black & the body is painted with automotive paint. We can add any option you need just call for a quote. This is the same as our classic offset trailer. The cook chamber is 30"x60" x 3/16" (7 Gauge) rolled steel not pipe, a second cooking rack on the front half, stainless door handles, stainless shelf & high temp fiberglass gaskets on the doors. The firebox has a 1/4" interior, 3/16" exterior, 4" of insulation, high temp fiberglass door gasket, 2" insulated fire door, slam latch & a easy to use air intake system with an aluminum hand wheel for the adjustments. Full aluminum body with matching team sign and 33"x48" wood storage. The pit is painted with high heat black & the body is pre painted aluminum. We can add any option you need just call for a quote.